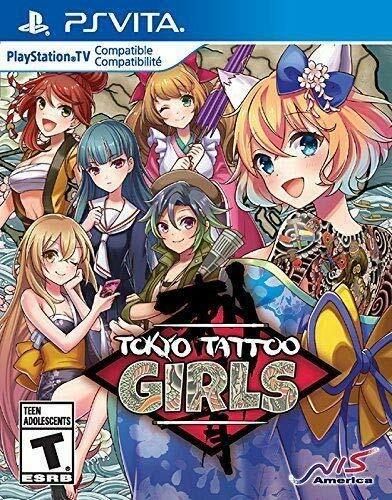 Tokyo Tattoo Girls is a bit of a bizarre game, mostly because “game” is used somewhat loosely in this context. TTG follows the story of a Tokyo after disaster strikes, leaving a handful of females across the city with strange powers. After being quarantined to the city, the women split Tokyo into districts and battle for control of the entire city. After the initial explanation, the story mysteriously disappears, and doesn’t really make a resurgence for the rest of the game. Your character takes the role of Tattoo Master, and joins alongside one of six different women to begin their hostile takeover of Tokyo. In similar NIS fashion, the girl’s designs are all very well drawn and extremely cute. While each girl has their own special benefit for the strategy part of the game, I never found that the character choice made much of an impact other than which girl you’ll be seeing constantly. In the start of the game, you’ll select a district in Tokyo to call your own, and eventually start expanding and taking over other districts. When selecting a certain district, you’re given a handful of moves along the lines of increasing your honor (health), recruiting new members, and hiding your presence from the other bosses. If a boss catches wind that you’re in their district, your honor will start to decrease. If you hit zero, you’re out of the game. The layout of the map and the commands isn’t particularly easy on the eyes, and isn’t very intuitive. It’s hard to figure out what you’re supposed to be doing in the game, and aside from a short somewhat vague tutorial, you’re on your own. This is where the game truly shows itself though, as even while you’re blundering about in the menus, it plays itself to an extent. Not a whole lot of strategy is needed to progress, and as your army grows, you will expand and get more money. Through more money, you can perform more commands and so on. The girl you’ve paired with in the beginning becomes your AI partner, and often performs moves and commands on her own throughout the session. This is where the game starts truly playing itself. While it was necessary for me to weigh in and reduce my visibility or recruit every now and again, your girl will handle a lot of that for you. In a sense, it almost feels like you have a second player helping alongside you and can actually be a pretty cool experience. However, on the other end of it, it makes your own movements feel that much less necessary. There is somewhat of an upgrade system that takes the form of tattoos. Using funds from your districts, you can purchase more tattoos for your female partner that increase certain commands or stats, such as your profits or health. Again, the upgrades don’t feel particularly necessary to the game, but watching your lady’s back slowly fill up with cool tattoos is oddly satisfying. Once you’ve recruited everyone from a district, you’ll enter a boss fight with the current leader of that district. The bosses all have a distinct character trait and design, and vary quite a bit from one another. It’s a shame that characters and story don’t play a bigger role in this game, as it feels like they could’ve had something here. All these “boss fights” are, is just a short visual novel where you are given three choices of what to say to the leader. You may be thinking that these dictate the course of the boss fight, but they do not. Once the boss fight has been entered, you will win no matter what. If you pick a good choice, you’ll recover a bit of honour, but there’s no threat of losing here. It’s a shame, as a boss fight with a rival faction leader would make for a pretty cool scenario. The art in the “boss fight” CGs looks gorgeous, however, and is one of the more positive aspects of the game as a whole. All the art aside from the actual main map is very appealing and is probably the main positive draw to the game. The map of Tokyo itself doesn’t look very appealing, is a dark grey color, and has a mass of different district names plastered onto it. The lack of design here is what makes the menu a little bit overwhelming, had more effort gone into the design, it would seem like more of a finished product. The artwork AROUND the map is beautiful however. Traditional Japanese art in the form of waves and flowers line the corner of the screen, and helps detract from the eyesore that is the map. Strangely enough for how simple the game is, there is a surprising amount of performance issues. I ran into a lot of lag when progressing through menus, and found often that the background would start stuttering rapidly as if a lot of action was going on. Load times can be a bit excessive as well. These issues may not be apparent on the PC version of the game, but are glaring on the Vita. 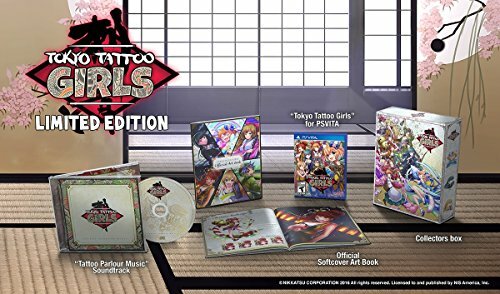 Overall, Tokyo Tattoo Girls feels like it had some ideas and some potential but reigned in player choice and involvement too hard for you to have much of a say with what’s going on. A full session only takes about an hour, and the lack of variety in the game and the playable characters negates any sort of replay value. With a severe lack of gameplay, and an absence of any story, there isn’t much to get invested in. This feels like it should’ve been a short, free game on the Vita marketplace, but with a price tag attached I truly don’t think there’s much reason to pick this one up. A confusing interface, lack of story, and lack of substantial gameplay ultimately ruins the decent foundation and pretty art built by Tokyo Tattoo Girls.